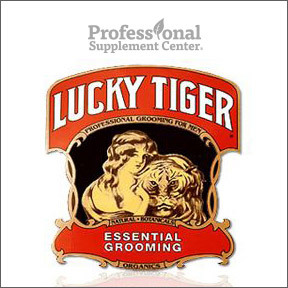 Professional Supplement Center is pleased to announce the addition of Lucky Tiger®, a line of classic grooming products specifically designed for men. 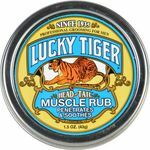 The Lucky Tiger brand was launched in the 1920’s when Benjamin Clarke, an amateur scientist and apparently quite talented barber, created a hair and scalp tonic he named Lucky Tiger® Tonic. Initially available only to barber shop customers, the popularity of the product quickly grew. Lucky Tiger® was trademarked in 1935, and the line was expanded to include shaving creams, mustache waxes, and hair dressings along with shampoos and facial cleansers. As time went on, the line was expanded once again to include products intended for home use. To this day, Lucky Tiger® maintains a loyal following and continues on its quest to provide the ultimate products for a top quality grooming experience. After Shave and Face Tonic – This modern take on a classic tonic is produced from a select combination of natural botanicals including aloe vera, calendula, chamomile and borage oil. Calming, moisturizing and rejuvenating, this soothing tonic provides the perfect after shave to promote a healthy, glowing polished look. Lightly and pleasantly scented with citrus essential oils. Liquid Cream Shave – This creamy product goes on like a lotion but turns into a rich lather that softens even the toughest of beards. Formulated with natural botanicals that replenish, hydrate, moisturize, and nourish the skin, while reducing razor burn. Finish with a splash of After Shave and Face Tonic and you’re ready to face the day! Head to Tail Shampoo and Body Wash – This non-drying peppermint and olive oil shampoo and body wash provides all-over hydration and cleansing. Gentle and long lasting, this concentrated vegetable-based men’s body wash offers an invigorating cleanser made with rosemary extract and pure peppermint, olive, and coconut oils. Paraben free. Head to Tail Muscle Rub – This concentrated essential oil formula penetrates and soothes aches and pains in muscles and joints. Formulated with lanolin, eucalyptus, wintergreen and menthol in a base of natural oils and pure beeswax. This entry was posted in Home and tagged After Shave and Face Tonic, Featured Brand – Lucky Tiger, Head to Tail Muscle Rub, Head to Tail Shampoo and Body Wash, Liquid Cream Shave, Lucky Tiger, Professional Supplement Center, Vitamins and supplements, www.professionalsupplementcenter.com. Bookmark the permalink.